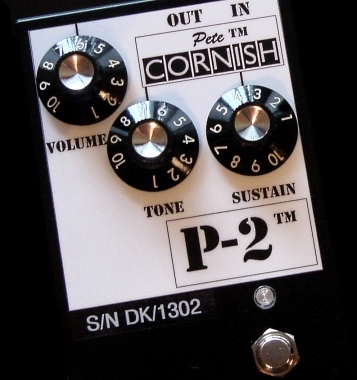 The PETE CORNISH P-2™ delivers extremely fat, smooth, and harmonically rich distortion tones, ranging from a relatively mellow crunch to searing high-gain sustain. The pedal is also extraordinarily responsive to playing dynamics, cleans up nicely with even slight guitar volume adjustments, and it provides nearly uncanny single-note definition within chords. Finally, it can crank out insane amounts of gain. Astonishing! Extremely fat tone, quiet, great dynamics, infinite sustain, exceptional chord definition. The input to this unique device is our universally acclaimed High Impedance, Unity Gain, Class A, Buffer Preamp with its superior RFI rejecting capability to eliminate Radio Station interference and Low Impedance Audio output, allowing the use of extended cable runs from the P-2™ in bypass mode. The fixed High Impedance load presented to the Guitar allows the pickups to operate at their optimum, even when several effects units are connected after the P-2™. The Unity Gain Buffer also prevents Ghost Distortion being audible in Bypass Mode. This effect unit gets the most benefit from being fed into a clean, full frequency response amplifier and I recommend that when you receive your pedal you connect it up without anything else in line, just Guitar/Pedal/Amp, and discover the way the controls interact, both with themselves and the guitar/amp controls. Then adding the rest of your effects, you may find that you need to make slight adjustments to these to compliment the constant signal level provided by the P-2™. The tone facility on the P-2™ has been designed to provide an attenuation of 14dB at 3KHz when set fully Counter Clockwise. When the tone control is set fully Clockwise it provides the maximum Harmonic Content to the signal. Settings in-between CW and CCW will provide varying amounts of high frequency attenuation: experiment to find your optimum setting. The tone control features fully passive frequency attenuating components that do not cause unnecessary phase shift or uncontrolled mid range problems. High Impedance RFI rejecting input and bypass buffer. Each unit is hand built, wired and tested by Pete and Lynda Cornish. Housed in a Rugged Die-cast box with Chicken-Head pointer knobs. Heavy Duty all-metal footswitch with Hi-Brite, low power consumption LED. DC adaptor: the size of the coax connector is 5.5/2.1mm and the centre pin is negative -VE. The voltage rating of the adaptor should be noise free, fully stabilized at 9.6V and capable of supplying 20mA. We recommend the use of the BOSS PSA series adaptors PSA-100/110/220 or 240 depending on your local AC supply voltage as meeting the above criteria and cannot accept any liability for damage caused to this unit by the use of any other type of AC/DC adaptor. Although the current consumption of our Stand Alone pedals is extremely low, giving an extended battery life, it may be appropriate to use an AC/DC Adaptor for long term usage. If a single pedal only is in use then the Boss PSA series will be cost effective but we do not recommend this unit for powering multiple effects as ground loops can become troublesome. This unit has been built using the finest available components and constructed to the highest standards but should any fault occur during the two years from date of purchase please return it post paid to the above address where under guarantee repairs of any original manufacturing fault will be carried out normal wear, misuse, unauthorized modifications or accidental damage excepted. The warranty will be voided if the guarantee labels are damaged or removed. This warranty does not apply to customers own equipment, which has been connected to this unit. This warranty is not transferable. ©Pete Cornish™ 2007. E. & O.E.